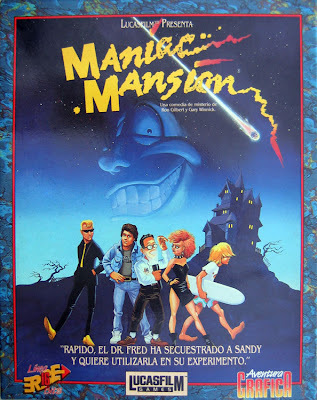 Maniac Mansion is a 3rd-person point-and-click graphic adventure game that was released in 1987. It was the first adventure game by LucasArts to use the SCUMM scripting utility (Script Creation Utility for Maniac Mansion). Dave's girlfriend Sandy is kidnapped, and he must go in to the creepy mansion with two other kids to save her. You must always have Dave in your party, but you can choose any of the other kids to go with you. The other kids have special abilities that can help you on your mission, and using these special abilities will lead to other possible endings to the game. All official versions of Maniac Mansion are now supported by ScummVM, a program designed to let 2D adventure games run on multiple platforms. With ScummVM, Maniac Mansion now runs on modern versions of windows, as well as Linux, Mac OS X, and many consoles such as Dreamcast, Wii, PlayStation 2, and PlayStation Portable. For a complete list of platforms supported by ScummVM, see here. A fan remake of the game was created by a group called Lucasfan Games using the Adventure Game Studio (AGS) adventure game creation program. The game was created in the style of LucasArts remakes like the CD version of The Secret of Monkey Island. This remake keeps the storyline and puzzles from the original game, but removes dead-ends (and changes one puzzle in the process), changes the verb menu to the simplified version seen in games from Monkey Island to Day of the Tentacle, adds dialog related to these new verbs, adds inventory icons, and has music throughout the entire game (taken from Day of the Tentacle). It is made without approval of LucasArts, but it has the (unofficial) approval of one of the original creators of Maniac Mansion, Ron Gilbert. The remake is available to download for free from the Adventure Game Studio website.